I am a city dweller, and have been for many years. I’ve always enjoyed the excitement and bustle of living in a space where people are constantly on the move, but it sometimes takes its toll. Studies show that city dwellers are more likely to experience stress, and are at an increased risk of developing mental health illnesses such as anxiety and depression, than people who reside in more natural, rural spaces. Luckily, I’ve always been drawn to the outdoors, seeking refuge from the city in the quiet spaces that nature provides. I spend hours, sometimes days on a trail and always return home with a renewed sense of calm. I’ve always jokingly referred to spending time in nature as my therapy, so imagine my surprise when I learned that the outdoors really can positively impact our health. 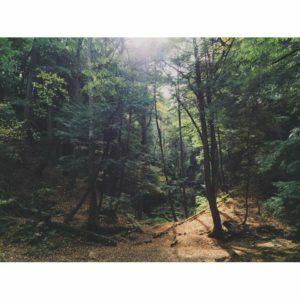 One day this summer I happened to be driving home from a hike in North Carolina, when I heard an NPR story on the Japanese practice of forest bathing. 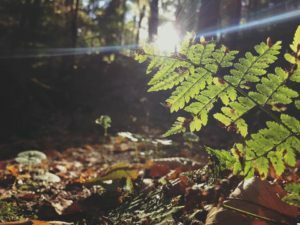 The practice, also referred to as forest therapy, was described as taking the time to be still and enjoy all that the outdoors has to offer. Forest bathing includes sitting or slowly wandering, focusing on being present and breathing, and immersing yourself in the natural experience that surrounds you. Calming yourself to a more meditative pace and allowing yourself to enjoy the sights, sounds, and smells that are all around you. In fact, the practice of forest bathing is different than hiking because when you hike, you typically have a destination in mind that you’re actively working to reach. When forest bathing, your goal should simply be to exist as you are, giving yourself time to reap the benefits that surround you. Improved Physical Health A study examining the affects of forest bathing on health found that spending time in nature has been found to have a relaxing affect by reducing stress hormones. Primary research also found that walking in nature can improve your cognitive function, and may even lower blood pressure. Improved Mental Health Studies have found that forest bathing, or spending time in nature, can have a positive affect on your mental health. In fact, a group of people who went for a walk in the woods were more relaxed, attentive, and felt happier than a group that went for a walk in the city. An additional study has also shown that time spent in nature can reduce rumination, which is described as being repetitive negative thoughts about oneself. Rumination is a known risk-factor for mental illness, and was shown to be reduced in those who have taken walks in nature. So now we know that spending time in nature can positively impact our physical and mental health, lets talk about what we can do to reap the benefits! Get Outside As a city dweller, you may have to make the effort to find the natural or green spaces in your area. Check out your local city parks and metro parks, or head over to the Ohio State Parks website to find a new outdoor destination! Slow Down One of my biggest takeaways is to remember to slow down when i’m in a natural space. As a hiker, I tend to focus on covering ground or finishing a trail, but it is so important to slow down and really allow yourself to benefit from the environment. All Year Long Many people look forward to the warmer months to get outside, but each season has so much to offer that it’s really important to focus on embracing nature all year long. During perfect autumn days like this, try getting out to enjoy the beautiful colors and brisk fall air. In the winter, take some time to bundle up and see what winter wonder awaits you in nature. I personally love exploring the outdoors after a fresh snowfall – it is a uniquely calm and beautiful experience in the outdoors. Take some time and look into outdoor experiences all year long! Amanda Woods M.Ed. is currently the Healthy Finances Program Specialist for Family and Consumer Sciences at Ohio State University Extension. 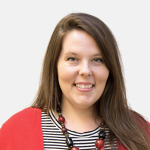 Amanda is passionate about community engagement and outreach, and enjoys being in a role that helps facilitate research based education throughout the many wonderful counties in Ohio. She believes education is a valuable and indispensable tool, especially when used to promote community health and well-being.